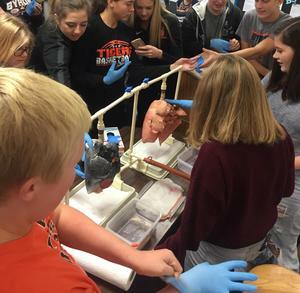 Monday and Tuesday students were able to interact with pig lungs in health class to better understand the dangers associated with smoking. Students were able to compare/contrast a healthy lung to that of a “smoker’s” lung. Within the blackened lung students were able to see and feel a cancerous tumor (one of many side effects from tobacco use). 22.B.4a- Explain social and economic effects of health problems on individuals and society. 23.B.4a- Explain immediate and long term effects of health habits on the body systems. 24.B.5a- Explain immediate and long term impacts of health decisions to the individual, family, and community.